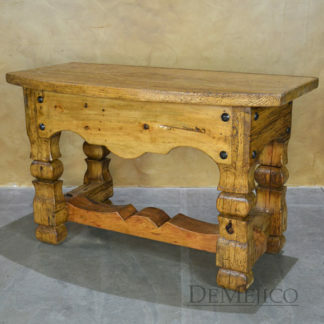 A simple addition to our Office Catalog, the Escritorio Viejo is a classic desk made from solid old wood. This desk features natural knots, stretches and imperfections in the wood, that are shown throughout the piece. With a very simple front side, the reverse side features two large drawers with hand forged iron hardware. Finishing off this old wood desk, one large raised panel sits on each side, for a subtle Old World touch.